A powerful explosion ripped through an outdoor market packed with Christmas shoppers in the southern Philippines on Sunday, killing at least 15 people and injuring 58 others, the military said. 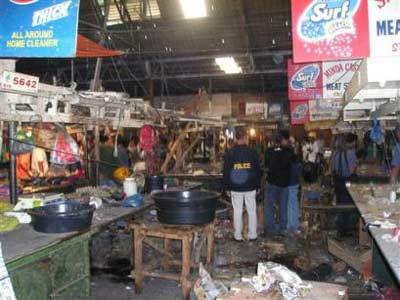 A homemade bomb or a grenade concealed in a box went off in the market's meat section in General Santos city. Officials immediately stepped up security, fearing more attacks in the port city 620 miles south of Manila. "This is a terrorist attack by any measure," Sen. Richard Gordon, who heads the Philippine Red Cross, told ABS-CBN television. He criticized the military and police for failing to prevent the attack despite what he said was intelligence information of an imminent terror strike in the city. "I'm getting reports from some of our people there that they knew there was a plan to pull this off but still it happened," Gordon said. "They need to bolster their spying and their surveillance of places that should be under guard." Army Col. Medardo Geslani, who heads a regional anti-terrorism force, said no group claimed responsibility and it was not yet clear if terrorist groups were involved. "It was most possibly caused by an improvised explosive device," Geslani said. Islamic and communist rebels operate in provinces near General Santos, and despite a crackdown by the military and police, Muslim militants are believed to still have a presence in the predominantly Christian city of 500,000. President Gloria Macapagal Arroyo strongly condemned the attack, saying there was no way to justify "this heinous deed." Police investigator Capt. Maximo Sebastian said three people were instantly killed by Sunday afternoon's bomb blast and other victims died in hospitals. "The market was packed with people because there were Christmas flea market stalls there, and the explosion was powerful," Sebastian said. In 2002, a bomb ripped through a shopping mall in General Santos, killing 14 people in an attack authorities blamed on the Muslim extremist group Abu Sayyaf and a larger separatist group, the Moro Islamic Liberation Front. Some of those arrested are being tried for multiple-murder charges. The sprawling archipelago has suffered a rash of bloody terror attacks and mass kidnappings in recent years that largely have been blamed on Muslim extremists. Communist rebels have staged attacks on security forces, local officials and have blown up electricity and cell phone transmission towers. The Philippines has been a key ally in the U.S. war on terrorism, with Washington providing extensive counterterrorism training and gear for the poorly equipped military. The Abu Sayyaf, an Islamic organization that appears on a U.S. list of terror groups, claimed responsibility for a bomb that killed more than 100 people on a ferry leaving Manila in February. It continues to threaten attacks despite battle setbacks and a reported lack of operational funds.